I have one that I haven't shared before - as you all know I don't do the spirit guide thing but the Hopi tell of one Guide, one that I consider to be the Greatest of all Guides - Many of us have heard the legend of Sky Woman, who fell through a hole in the floor of the Upper World. How she was caught by Crow and placed on the back of Turtle because the world was only water. We know how Muskrat dove to bottom of ocean floor to gather a paw full of mud, how she gave it to Sky Woman who placed it on Turtles back and made Turtle Island. We have also heard of Corn Maiden, White Buffalo Calf Woman, and of course, Earth Mother; All very important Women in the stories of Creation. Yet one often overlooked, the Greatest Guide of all Guides, Grandmother Spider, aka Spider Woman. The Hopi tell of how creation began first in a vision had by Tawa, the Sun Spirit, a dream of Creation, He dreamed of 9 dimensions, 9 worlds. The first world was that of Void, of Endless Space, all was Dark; It was during the time of this world that he also called his Spirit People into being. He separated void into Day and Night, allowing his light to shine during the day, and for the night, Tawa created the Stars and the Moon. The second world came to be, yet as the light of this world touch the darkness of the first, a third world was created, the world of Shadow, and in Shadow, life began to be. 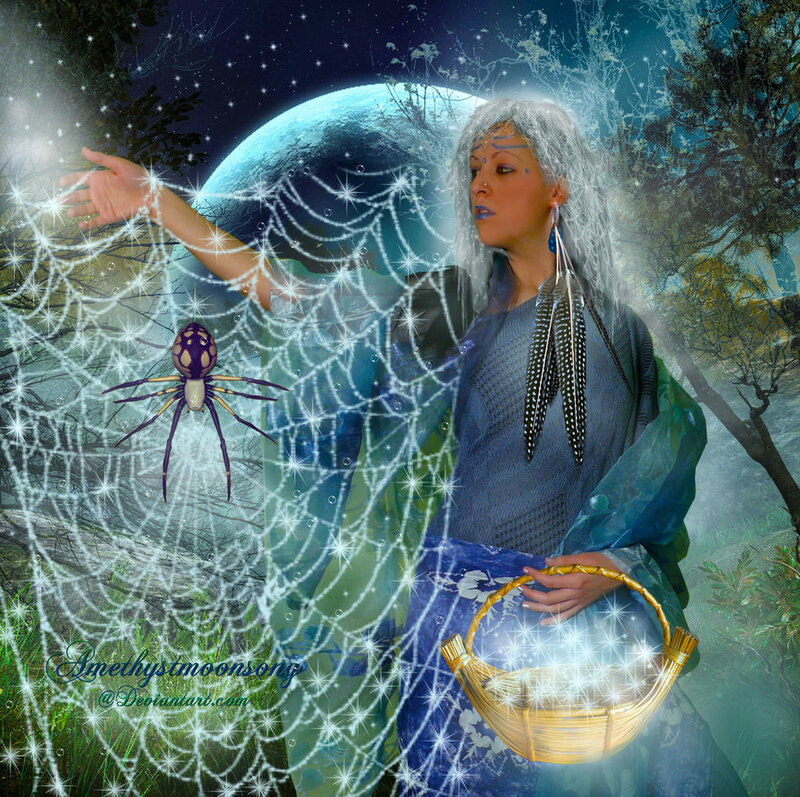 Tawa and Grandmother Spider held council and She learned of her role through the 9 worlds, She would be the Guide of Transition between worlds, Teacher and Storyteller in each new world. She led us from the third world of Shadow into the world we now live in, the fourth world. This world is one of the physical, a world of reality. She has taught us how to develop, to grow and to adapt to the changing conditions in this time of walkabout. She has taught the ways of Gatherer, and then that of Hunter. She taught us how to sow seeds and to harvest. She led us into the modern era of industrialization. Grandmother Spider will also guide us as we leave this fourth world and enter a world of thought, of mind, of communication, the Fifth World. So the Hopi elders say and I believe it was and will be.